The Jackson County Developmental Center (JCDC) in Milwood, WV provides quality support for life training and employment opportunities for people with disabilities. The center was founded in 1979 when a small group of interested citizens recognized the need to address the vocational challenges faced by individuals with disabilities in Jackson County. The organization began operations on a two-day-per-week basis for six individuals in donated space in a local church. Now, almost forty years later, the Center has expanded its vocational services to help adults with special needs learn about the world of work and how to get a job. 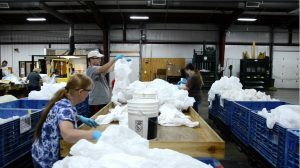 The center aslo employs individuals with disabilities in the recycling business, the manufacture of wiping cloths, several data management projects, and a telephone contact center. They serve adults with special needs in Jackson, Mason, Roane, Calhoun, Wirt, and Wood Counties in West Virginia. Recently, the JCDC has started a partnership with Kimberly-Clark Professional’s RightCycle Program to provide employment for people who have survived traumatic brain injuries or have been diagnosed with autism spectrum disorders, learning disabilities, and other conditions. The JCDC employees remove zippers and other metal parts from protective garments so that the apparel can be recycled through the RightCycle Program, the first large-scale recycling program for non-hazardous lab, cleanroom, and industrial waste. “Oftentimes people with disabilities are treated as if they can’t work,” said Sara Rose, development and communications specialist for JCDC. “The RightCycle Program provides them with a job and a very clear task. It’s adaptable for lots of different ability levels – whether it’s removing a snap or zipper or processing the whole garment.” The RightCycle Program diverts previously hard-to-recycle items, such as single-use garments and gloves, from the waste stream and turns them into plastic pellets. These are then used to create consumer products and durable goods such as shelving, totes, and lawn and garden furniture. Since its launch in 2011, the program has diverted more than 450 tons of waste from landfills. For JCDC employees, the program benefits extend beyond the financial. “They grow by leaps and bounds because of the quality of life gained from employment,” Rose said. “The work also provides a sense of community and belonging.” For some, the experience has been truly life-changing. One current employee arrived at JCDC from another agency with a blunt assessment: “He can’t really do anything.” Now, he’s been named employee of the year three times. “He works hard here,” said Crockett. “He bales. He counts. He weighs the bales. It just shows that with some patience, understanding, and a willingness to let people show you what they can do, they can do anything.” It’s a ripple effect that is felt well beyond the JCDC production floor.